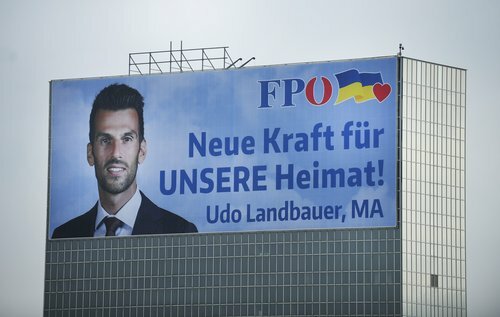 This photo shows election propaganda for Austrian far-right politician Udo Landbauer of the FPÖ party. The slogan on the poster says, translated: New force for OUR fatherland! Today, there is news about him. In Austria, scandal has arisen about FPÖ [racist party in the present right-wing Austrian coalition government] politician Udo Landbauer. At the student fraternity where he was vice-chairman, anti-Semitic songs are sung. The Viennese newspaper Falter received the songbook of student society Germania. The Nazis murdered 6 million Jews in the Second World War and about 5 million other people [a very conservative estimate], including Roma and Sinti and disabled people. In other songs Hitler’s conquests, the Wehrmacht [Hitler’s armed forces] and the Waffen-SS are glorified. A gooky Chinaman stepped into their midst. We too are Indo-Germans and want to join the Waffen-SS. Landbauer (31) has been a member of the ‘Burschenschaft’ (traditional German student association) Germania for sixteen years, but denies that he ever saw this song. President Alexander Van der Bellen does not believe him. “The members must have known what is in that songbook”, he says. Austrian police have searched Wednesday evening at the association and seized nineteen songbooks. It is being investigated whether anyone can be prosecuted because of incitement. The Austrian Interior Minister Herbert Kickl, also FPÖ, has said that he virtually excludes any prosecution of Landbauer. The opposition has responded with anger. “In a democracy, the Public Prosecution Service carries out the investigation, not the minister”, said politician Max Lercher (SPÖ). In Austria, a coalition of the conservative ÖVP and the right-wing populist [‘populist’ is a wrong term by journalists too scared to use more correct terms like ‘racist’] FPÖ has been ruling since mid-December. The FPÖ was founded by former Nazis and came into the news with various Nazi scandals. These are always dismissed by the party as exceptional cases. Also from national party leader Strache photos surfaced in uniform and between neo-Nazis. Austria to dissolve Nazi songbook fraternity linked to Freedom party. Move follows discovery of lyrics mocking Holocaust and celebrating Nazi atrocities: here. VIENNA (Reuters) – Austria’s main Jewish body (IKG) will boycott a parliamentary Holocaust commemoration event because of the rise of the far-right Freedom Party (FPO) which entered government last month, the IKG’s chief said on Thursday: here. An Austrian Jewish leader worries Israel may be embracing the far right. Netanyahu’s ‘realpolitik’ weakens European Jewry, Ariel Muzicant argues, vowing to fight any attempt by Jerusalem to normalize ties with Freedom Party. By Raphael Ahren, 23 March 2018, 6:45 am. USA: WASHINGTON (JTA) A Pennsylvania Republican congressman running for the Senate was interviewed by and appeared at an event with Holocaust deniers, CNN reported: here. Like him to try out the fumes and heat first. Idiot.